We are looking for submissions for our Ready, Set, Stamp feature on the following theme for our November issue of Craft Stamper. If you've always wanted to see YOUR card in print, now is your chance!! Our Amazing August issue hits the shops on Friday! 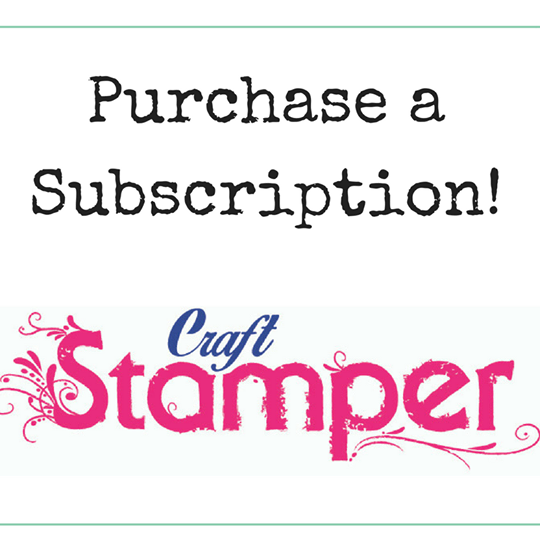 The August issue of Craft Stamper magazine hits the shops this Friday (1st July), our wonderful subscribers will be receiving their copies very soon, if not already! This month is our very special CARD MAKING issue! We wanted to show you how to translate all those mixed media techniques to cards, so every feature in this issue has at least one card example for you to see! We have four fabulous digital images to share with you all this month. Stampotique designer Kira Nichols is sharing an adorable quirky snail! Trish has also done a real time video exclusively for CS readers, to show how she uses the digi images (as well as creating a messy painty background!) The link, and password needed to access the video can be found in the magazine. An amazing colouring tutorial from Kim Costello..
And Michelle Webb shares a fabulous use for those little wooden bits that come with a canvas! This month, we have lots of giveaways dotted about throughout this issue! We are offering our readers a chance to win the products used in different features, something that we will be doing lots of in the future. So, lots for you all to experiment with, and don’t forget, we would love to see what you create! Email us, or share on our Facebook page! Or... why not ask your local craft store to stock the magazine! We supply shops all over the world :) Information on how to stock Craft Stamper can be found on our web site, or email us and we'll help! Take It Make It Challenge: June Winners! We are so pleased to announce the winners of our June Challenge: Take A Technique: Lets Get Inky! We loved the amazing layering of the flowers, such a wonderful colour palette too! 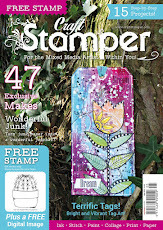 Avril will win a Guest Designer slot here on the blog, her very own Winners Profile, and of course her amazing art will be featured in it's own 2 page spread in Craft Stamper magazine! Congrats Avril! Lemoncello, Black Currant, A Bit Jaded, Are You Cerice and Emerald Isle. Congrats Julie, we hope you have loads of inky fun with the infusions! Our July challenge will be launched next Friday, July 1st! Cornelia won the challenge with this amazing card! We loved the bright bold colour, and the striking bird image, so much fun! A: I really got hooked on stamping somewhere late in 2012 - my sister did that to me…. A: Definitely leaning towards CAS, although I step out of my comfort zone every once in a while. Messy is not my thing (except for my craft room) - the messiest thing I do is splattering, but that I do liberally! A: One product only???? Well in that case it's going to be stencils. Congratulations Cornelia on being our May Design Winner, and it was lovely to learn a little more about you! Our current challenge 'Take A Technique: Lets Get Inky" is open until next Wednesday evening, so still time to enter! Don't forget the fabulous prize, a set of five PaperArtsy infusions! See you back here next Friday, where we will be announcing the winner of the June challenge... Good Luck! Infusions are water soluble particles with 2 components: dye colour pigment suitable for paper/ fabric, mixed with Walnut Stain. The colour powder particles dissolve faster than the walnut crystals, so you can control the colour-to-brown stain ratio! I hope the prizes have given you all an incentive to win...... and how about some eye candy from the DT to give you some beautifully inky (and stamped) inspiration!